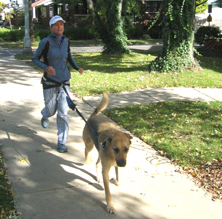 My wife, Kathy, and I both had the same problem when exercising our two large dogs; Pluto and Kipper. They were in control, pulling us down the street rather than us controlling them. Training is an important part to the dog experience and so is the owner being the controlled leader. Early on some comments were…”If your dogs were trained you wouldn’t need this thing!” I agree. However, since 2000 we have learned that the Tug-No-More is beneficial across many spectrums. It allows you to walk and/or run your dog(s) hands-free maintaining the free flowing arm motion that was lost having to hold onto a leash and/or poop bag/scoop! For training purposes, we have built standard leash handles onto our leash leads and leash extensions for leash handle use if preferred. It allows you to obey leash laws in your community and keep your hands-free! It allows you to control any tugging motion you may experience with your dog(s). 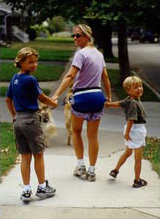 Unlike other “hands-free” contraptions that wrap around your waist, arms, neck or shoulders, the patented Tug-No-More, is a harness that the individual wears around their hips & buttock (body center). If your dog(s) do pull, the tugging energy is directed to your body center area. It alleviates the problem of your dog(s) pulling on your back, arms, wrists and shoulders. There is a poop pouch built right on the leash and a 'quick release' to release the leash lead from the harness at a moments notice. Our new Tug-No-More ‘Sport’ Harness is made with a quality black mesh making the harness lighter, breathable and fashionably pleasing. We have also added a ring to the back of the harness to conveniently clip the leash lead if your dog(s) prefer to walk/run behind you. The Tug-No-More ‘Original’ is our first model that is made with a blue nylon foam pad. It provides extra cushion around your hips and buttocks. Our Poop Pouch is also sold separately and works terrific on a standard leash. Our Tug-No-More harness systems have been designed to be used with any size dog and any size person. Our systems can be ordered for dogs under 20 pounds and for dogs over 20 pounds. The size of the hardware is appropriate for the size and weight of the dog. Our harness is designed to fit everyone! Can you use the Tug-No-More system with more than one or two dogs? Absolutely! Can dog(s) attached to the Tug-No-More Harness System cause loss of balance or control to the individual in the harness? Sure, it is a possibility. Size and weight of the person using the harness, environmental conditions and size, weight and quantity of dogs anchored to the Tug-No-More Harness System are all variables in whether Tug-No-More is appropriate for the harnessed individual. The temperament/behavior of the individual and the temperament/behavior of the dog(s) attached to the system are important factors in determining whether Tug-No-More is appropriate. It is the responsibility of the individual using Tug-No-More to determine whether the Harness & Leash System is appropriate and safe for their use. 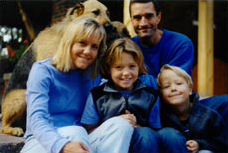 The patented Tug-No-More Human Harness & Dog Leash System is proudly manufactured in Detroit, Michigan (USA)! Greetings from the Tug-No-More Clan!